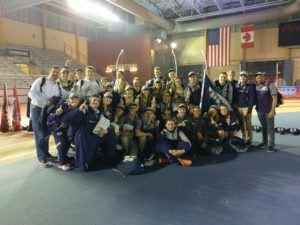 Queens University of Charlotte men’s and women’s teams won their respective NCAA Division II national championships for the third year in a row. While the Royals were scarcely challenged in the men’s meet, the women had to fight for every point to keep Drury from ending their streak. Female Diver of the Meet: Monica Amaral, University of West Florida – For the second year in a row, Amaral swept the diving events. She scored 478.25 points to win 1-meter diving on Thursday, and 505.20 to win the 3-meter board on Saturday, contributing 40 points to the Argonauts’ 6th-place team finish. Female Diving Coach of the Year: Kelly LaCroix, Wayne State University – Wayne State won 48 points in women’s diving events; 31 in 1-meter and 17 in 3-meter. Diving contributed 25% of the Warriors’ 189 points and helped secure their 7th-place team finish. Male Diver of the Meet: Brad Dalrymple, Grand Valley State University – Dalrymple won a narrow victory in 3-meter diving on Wednesday, scoring 513.70 and winning by 2.05 points. He was runner-up in 1-meter diving on Friday and his 37 points helped the Lakers finish 5th in the team standings. Male Diving Coach of the Year: Steve Burciaga, Grand Valley State University – Burciaga’s divers, including Dalrymple, scored a total of 85 points in two events, fully 1/3 of Grand Valley’s total for the weekend, a major contribution to their 5th-place finish. Female Swimmer of the Meet: Theresa Michalak, University of West Florida – Michalak won all four of her individual events (50 free, 100 free, 100 breast, and 100 fly) and set NCAA Division II meet records in three of them (100 free, 100 breast, and 100 fly). She also contributed to the Argonauts’ 200 medley relay, 200 free relay, and 400 free relay. Female Swimming Coach of the Year: Brian Reynolds, Drury University – The Panthers gave defending champions Queens a real run for their money, getting big performances out of a very young squad. Reynolds’ freshman Bailee Nunn broke three NCAA Division II records: 50 free (leading off Drury’s 200 free relay), 100 breast (in prelims) and 200 breast (in prelims, then again in finals). The 100 breast was later broken by Michalak, but Nunn joined Michalak as the only two athletes in the history of Division II to break 1:00 in the event, when they both went 59s in finals. Male Swimmer of the Meet: Marius Kusch, Queens University of Charlotte – Kusch won the 200 IM, 200 fly, and 100 free, and was runner-up in the 100 fly. 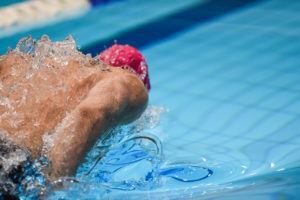 He broke the NCAA Division II meet record in the 200 fly. 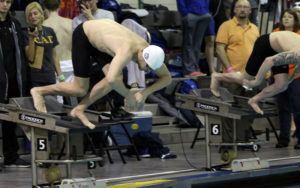 He also broke meet records as part of Queens’ 400 medley relay, 800 free relay, and 400 free relay. Men Swimming Coach of the Year: Jeff Dugdale, Queens University of Charlotte – Dugdale piloted the Royals to their third consecutive national title breaking five NCAA Division II records on the men’s side alone: 200 medley relay, 400 medley relay, 800 free relay, 200 fly, and 400 free relay. Queen wins with class. Bravo! D2 would be in big trouble if Trump decided to build a wall! It seems that Queens, Drury, et al. are ESL. Queens ohas 8 internationals listed on its men’s roster. One of those is from new Zealand, so I’d imagine that English is his first language, not second. Queens women only have 4 internationals on their roster. Drury men have 8 internationals listed as well. Drury women have 5. Those numbers don’t really seem too outrageous to me, but I suppose everyone can have a different opinion of where the threshold of “too much diversity on a team” falls. Having diversity is HUGE for NCAA swimming and I wish more foreigners swam NCAA. Beachair, I just pulled up rosters for eight men’s D1 top ten ranked programs. Most had about 5-6 athletes from outside the USA. Alabama has 8. D2 clearly has many international athletes, but I think we recruit some pretty amazing talant who make D2 more exciting. They raise the bar, which is a good thing. When I look at the Queens roster and compare it to other teams, it is quite typical as far as international vs. domestic swimmers. Queens/Dugdale & run a top notch program. There was great competition at NCAA’s, and it is getting faster. Look at the times on the relays. Fast is GOOD.